Hanaholmen is served by the metro. The walking distance from the nearest metro station ”Koivusaari” to Hanaholmen is approximately 1,1 km. – Buses 143A, 146A, 147A ja 164A/164VA operate along Westway, between Helsinki city centre (Kamppi) and western Espoo, with a few minutes interval during rush hours on weekdays. – Bus 192 (V, T and K busses) operates along Westway between Inkoo and Kamppi (Helsinki city centre), few times in the morning and afternoon on weekdays. – Bus 104 works as a feeder bus between Hanaholmen and Lauttasaari metro station operating few times in an hour on weekdays and less frequently during weekends. The bus stop along the Westway is cirka 400 metres from Hanaholmen. For further details of public transport please check the Journey Planner. Ask for Hanaholmen Cultural Centre, Espoo. The taxi journey from the city centre of Helsinki to Hanaholmen will take approximately 10 minutes and costs about 20 euro; from the airport it takes approximately 40 minutes and costs about 45 euros. Please note that there is a risk of confusion, since there is a power station in East Helsinki called Hanaholmen, so be sure to ask the driver to take you to Hanaholmen Cultural Centre in Espoo. Hanaholmen is right next to the main Länsiväylä road (“the Westway”, route 51), a little to the West of Koivusaari and to the East of Karhusaari and Tapiola in Espoo. Hanaholmen may be reached by car from a local junction on the Westway, lying midway between Lauttasaari and the Ring I / Tapiola intersection. There are bus stops at the junction (the GPS co-ordinates are N60º10.0 E24º50.6). There is also a signpost at the junction indicating “Hanaholmen “. Hanaholmen is cirka 6 km to the West of Helsinki. From the West: Approach Helsinki on the Westway (route 51) and follow the signpost at the Hanaholmen junction. From the North (e.g. from the airport): Approach Helsinki and turn off at Ring I westbound. Follow the ring road to the Westway (route 51), and then drive towards Helsinki Centre. The signpost for Hanaholmen is about one kilometer after the Ring I, Westway intersection. 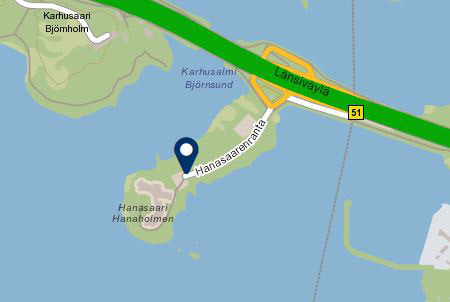 Hanaholmen Cultural Centre has its own jetty on the western side of the island at N 60º09.9 E 24º50.4.